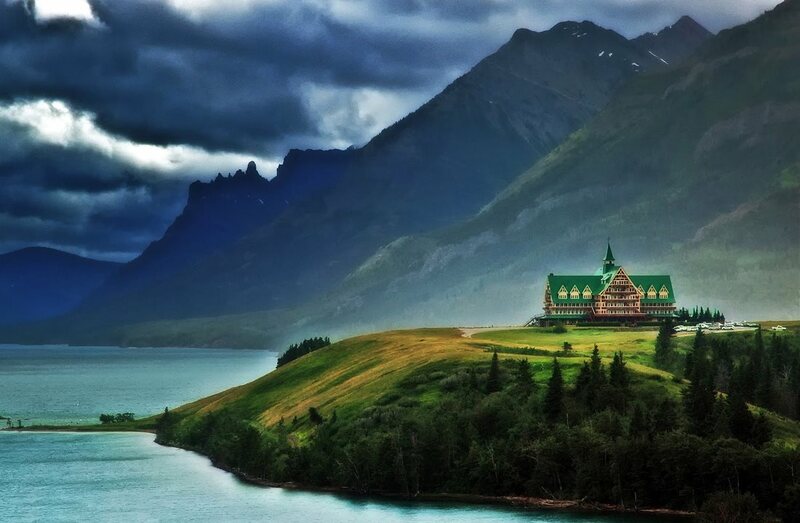 The Prince of Wales Hotel is located in Waterton Lakes National Park in Alberta, Canada, overlooking Upper Waterton Lake, near the Canada-United States border. Constructed between 1926 and 1927, the hotel was built by the American Great Northern Railway to lure American tourists north of the border during the prohibition era. The hotel was named after the Prince of Wales (later King Edward VIII), in a transparent attempt to entice him to stay in the hotel on his 1927 Canadian tour, but the Prince stayed at a nearby ranch instead. The Prince of Wales Hotel enjoys the distinction of being the sole establishment among Canada’s grand railway hotels to have been built by an American, as opposed to a Canadian, railway company. The hotel was designated a National Historic Site of Canada by the Canadian government in 1995. The Prince of Wales Hotel was built as an extension to the chain of hotels and chalets built and operated by the Great Northern Railway in Glacier National Park, Montana. Louis Hill, President of the Great Northern Railroad, picked the site for the hotel in 1912. It took until 1926 to get the land leased from the Canadian Government and construction began immediately thereafter. When Mr. Hill decided to build the hotel, he planned for a building somewhat like the Many Glacier Hotel in Montana. The original plan called for a long three-storied, low roofed building with a central lobby and approximately 300 rooms. As the building progressed, Mr. Hill changed his mind several times so that some parts of the building had to be rebuilt four times. He wanted the building to resemble French or Swiss chalets. 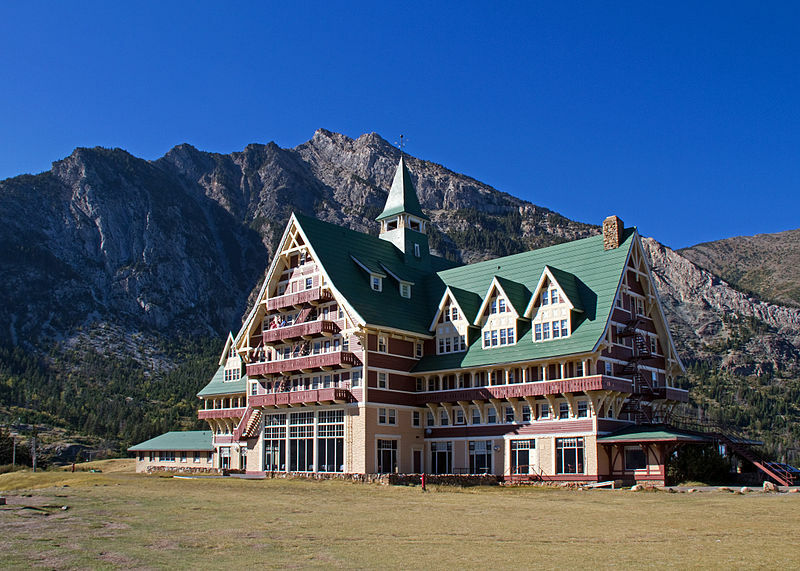 Hill’s final vision stands today, a proud hotel overlooking the township of Waterton; complete with 86 rooms in seven-stories and crowned with a 30-foot bell tower. All materials and supplies for the construction were shipped via railway to Hill Spring and then transported the last 25 miles by mule team. During construction the building crew faced numerous obstacles including a spring thaw that turned the 25 miles of road into a muddy quagmire and high winds that blew the building off-center twice. The fear of these high winds almost caused the project to be abandoned but construction finally proceeded and the building was completed and officially opened to the public on July 25, 1927. Occasionally the building will sway slightly when the winds are heavy, but there is no danger because the building was constructed to withstand even the fiercest of gales. The building is anchored to its site by means of large cables installed from its loft, through the structure and into the ground itself. The hotel is named after the Prince of Wales, the popular Prince Edward, who was later to become King Edward VIII. He was admired and adored worldwide, even after his abdication of the British Throne in 1936 when he chose to marry a commoner from America. The hotel was designated a National Historic Site of Canada in 1992 with Plaque status granted in 1995 and was highlighted in the 2008 National Geographic™ Crown of the Continent Geotourism Map Guide. The Prince of Wales Hotel is a smoke free, 7-story facility with designated outdoor smoking areas. Check-in time is after 3:00 p.m. and checkout time is 11:00 a.m. All rooms are accessed via stairs and are sold based on view or room size. An antique elevator is available for floors 2 through 4 and requires assistance to operate. There are no ADA-accessible rooms available at Prince of Wales Hotel. The self parking lot is located a short walk from the hotel. ← Coastal Travel Vacations is NOT A Scam! !